Thomas Midgley Jr is not a name near to many people’s lips when asked about the most important scientific innovators of the twentieth century. Seemingly destined to be remembered solely as a speciality question in a pub quiz would appear a strange fate for a man whose contributions to science shaped the world and led him to being described as having a ‘greater environmental impact on the planet than any single organism in history’. It is then unfortunate for Thomas Midgley Jr that the impact described was both an accidental consequence of his inventiveness and wholly negative in almost every conceivable aspect; for Thomas Midgely Jr is the man who came with the idea of adding lead to petrol. Not content with this world health hazard, his second invention was close to catastrophic, as he found a way to improve the process of refrigeration through a compound called Freon. In so doing he successfully managed to invent CFCs. One can only imagine that after those two disastrous attempts at improving the world, poor Thomas Midgely Jr would have a great deal of sympathy for Johann Wilhelm Möbius, the scientist at the centre of Dürrenmatt’s farcical satire that poses questions on the burden of responsibility on scientists and the ability of state to understand and manage scientific developments. Indeed Möbius is so concerned with the potential capacity for destruction in his inventions that he decides it is better to feign insanity so that he is able to work on pure physics well away from the overbearing hand of the state. Dürrenmatt wrote The Physicists in 1961, prefiguring the Cuban Missile Crisis but at a time when tensions between the Soviet Union and the West were reaching a new peak. The horrors of Hiroshima and Nagasaki remained fresh in the mind 15 years on, as societies across the world lived in the shadow of two countries committed to the real-politics of mutually assured destruction. 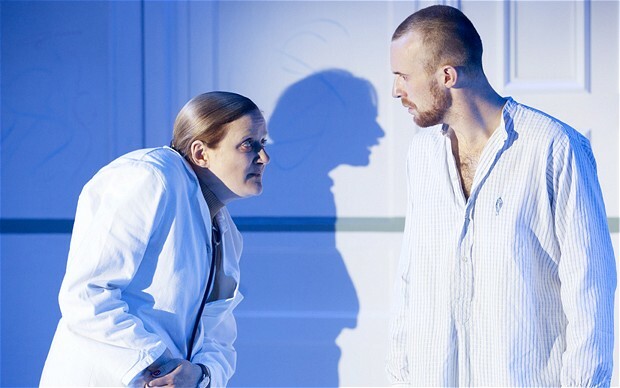 Charles Spencer, writing in The Telegraph, challenges the play’s value forty years on. It is a reasonable point at a time where the conflict between superstates has faded and the prospect of nuclear war has receded to be replaced by a more existential threat of individual extremists, dirty bombs and cyber-warfare. Josie Rourke’s production is never quite able to square this circle and throughout there remains the nagging sensation that one is watching a period piece; a very well-crafted and carefully staged absurdist drama that is fascinating but ultimately as clinical and sterile as its setting. That is not to say that it cannot be enjoyed on its own merits. The quality is to the level that has come to be expected from a Donmar production. John Heffernman is superb in capturing the duality of Möbius’ character; drawing out the dignified trauma of being self-aware enough to understand that his brilliance can never realise its potential in a world where it will be handled by those with power but no understanding, but Heffernman also reveals the arrogance that afflicts many geniuses and causes them to underestimate the skill of the opponents, in this case hastening the final tragic denouement. Heffernman is well supported by an engaging Sir Isaac Newton (Justin Salinger) in a performance that adds some comic verve to a script that too often sacrifices humour for waxing philosophically on the responsibility of scientists. Sophie Thompson, as Dr Matilda Zahnd, also brings energy to the role, playing it straight out of a Hammer Horror Frankenstein with inevitable nods towards Dr Strangelove. Most impressive of the supporting cast is Miranda Raison; as Möbius’ wife Raison brings some much needed humanity and emotional warmth to the play. In the scene where Möbius rejects his wife and sons, the play comes dramatically to life and reveals that a tragic heart beneath the satire. There is a real pain in the rejection and in the revelation of the burden that Möbius’ action has put on the rest of his family. It is here that Dürrenmatt teases a question about the wider consequences of the scientists’ action but unfortunately it is closed off and does not trouble the rest of the play. The Physicists raises some very interesting questions about the moral responsibility of scientists. It recognises and challenges the state’s ability to act in an ethical manner towards scientific discovery, and Dürrenmatt is excellent at revealing the hypocrisies and inherent philosophical contradictions in the deals that are struck between science and state. The tragic finale is a superb indictment of the fallibility that often lies within genius and reveals a final bitter joke that goes right to the heart of the play. 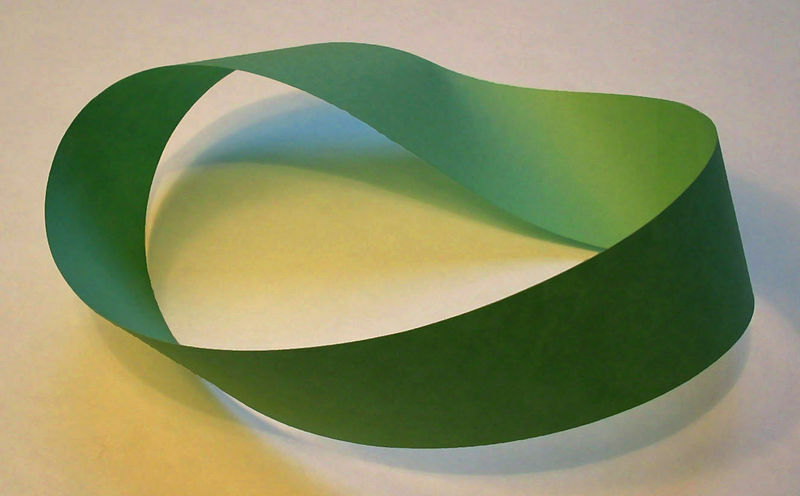 It is not made explicit by Dürrenmatt but, by naming of the central character in tribute to August Ferdinand Möbius, a reference to the play’s narrative journey as being the equivalent of traversing a Möbius strip is surely being made. 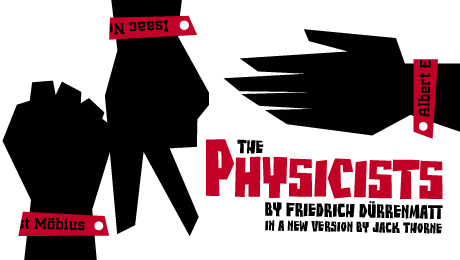 Whilst Josie Rourke has failed to match the acclaimed start she made to her reign at the Donmar, The Physicists remains a very solid production backed by strong performances and a script that is skilfully put together by Jack Thorne. The set and lighting design makes good use the stark white backdrop of the mental hospital to sear images into the mind by instantly snapping to black. However the production as a whole cannot quite escape the sensation that the enticing elements are in support of a premise that works better as a historical curio than a modern relevant production. CT scan far outweigh the chances of the cancer increasing. Once you get hold of a degree of the radiology technician, there is no stopping you. This large Yale trial is reaffirmation that anyone with a family history be evaluated.